During the winter months, it’s not uncommon to see articles about the benefits of home energy audits, especially as a solution to controlling energy bills while maintaining thermal comfort. But home energy audits serve another purpose year-round: saving lives. Heat is Where it’s At. How Does a Duct System Work, and Why is it So Important? How Can You Detect And Fix AC Refrigerant Leaks? Caption: Average monthly energy bills are $14 at the Villas at Rocketts Landing, DOE's 2017, Housing Innovation Award Winner, thanks to a combination of solar power, tight construction, air sealing and innovation HVAC system placement and insulation. Evaporative coolers, also known as swamp coolers have become a top choice for anyone looking for an alternative cooling solution from their home or office. In the past, evap cooler technology was limited for use in large operations that have easy access to exterior air such as factories. Raising the BARrier in North Carolina Mountain Home, Making it Super Air Tight! In 2013, building owner Josh Miller worked with Elevate Energy to reduce the cost of utility bills in his two-story building in the Logan Square neighborhood of Chicago, as well as improve the overall comfort of the units. Sparky Doubled the Air Leakage in this Home! 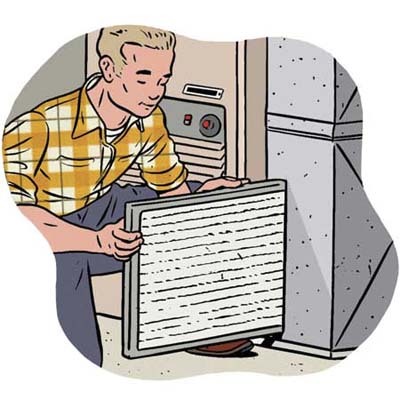 Furnace filters work to expel cruel polluting influences from your indoor air supply. These substances incorporate outside particulates and undesirable airborne pathogens. While there is an extensive variety of air filters with different scopes of filtration limit, generally these filters just uproot contaminants at a particulate level. It’s really nice when hard work pays off. What air conditioner filters work best? Heat transfer: How Heat Gets Out of Your Home and Costs You Money.